Japan refuses to reveal naval data requested by the U.S. and Britain. Germany and Russia agree new trade pact, that provides for the delivery of vital war materials (grains, oil, strategic minerals) by the Russians, in return for German manufactured goods. Anthony Eden greets the first Australian and New Zealand troops arriving in Suez. The British foreign Secretary, Anthony Eden and General Sir John Dill, Chief of the Imperial General Staff leave London for a tour of the Balkan capitals in order to try and establish an anti-axis pact. However, Yugoslavia refuses to see them and Turkey refuses their proposals. Only Greece shows and interest. Again, the Italians make further breakout attempts, which all fail. Later in the day the Italians surrender 20,000 men, 200 guns and 120 tanks to just 3,000 British troops. Anthony Eden makes a speech parodying Winston Churchills famous ‘Battle of Britain’ speech. He says “Never has so much been surrendered, by so many, to so few”. 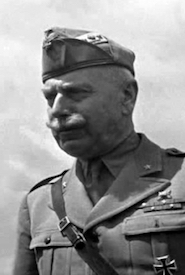 General Gariboldi is the new Italian Army Commander in North Africa. Erwin Rommel arrives in Tripoli, Libya with a Panzer and Motorized Infantry Division. He assumes command of the Deutsches Africa Korps. Rommel receives assistance from the Fliegerkorps X and long range aircraft from Sicily. Churchill congratulates Wavell for his success, and orders him to prepare to help the Greeks. German planes attack Benghazi, the first action by the Luftwaffe in Africa. At 11.00 hours, British aircraft spot the Scharnhorst and Gneisenau and Prinz Eugen as they enter the straits of Dover. At 12.00 hours the British launch MTB attacks against Admiral Ciliax’s squadron, but were forced to fire at extreme range and so missed. An hour later at 13.00 hours the British again launch torpedo attacks, this time using six Swordfish aircraft, but five were shot down and all torpedo’s missed. At 14.30 hours the battleship Scharnhorst hits a mine off the Dutch coast. The mine inflicts only minor damage and the Scharnhorst is able to continue towards Germany. A short time later the British again launch attacks against the three German ships, this time using destroyers from the port of Harwich and aircraft from both Bomber and Coastal commands, but without success. At 20.35 hours the battleship Gneisenau hits a mine, while at 20.55 hours the Scharnhorst hits its second mine of the day, although both ships are able to continue towards Kiel. Rostov is captured by Russians. German troops evacuate Krasnodar and reach the defensive positions in the Kuban bridgehead. German bombers attacked port of Bari on Adriatic, sinking 16 freighters including an American ship carrying poison mustard gas shells, causing heavy casualties in the port. Rommel and Von Arnim’s forces launch a counter attack against the American 2nd Corps in central Tunisia, forcing them back in some disarray. Wingate’s first Chindit guerrilla campaign begins behind the Japanese lines in Burma. VMF-124 lands on Guadalcanal, becoming the first Corsair squadron deployed for combat. The Red Army recaptures Luga. British and Canadians troops advancing from Southeast Holland take Cleve in western Germany. Simultaneous announcements in Moscow, London and Washington about the Yalta agreement. Agreement is reached about the allied occupation of Germany, the founding of the United Nations, the “resettlement” of the inhabitants of the eastern German territories to be ceded to Poland and the entry of the Soviet Union into the war against Japan. Thus far, the Kriegsmarine has evacuated 374,00 German refugees by sea from East and West Prussia. The British 20th Indian Division crosses the river Irrawaddy Southwest of Mandalay. Peru declares war against Germany.